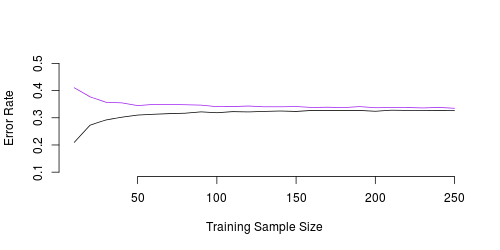 The curve below is the error on the training sample, as a function of the size of the training sample. Above, it is the error on a validation sample. Our learning process is consistent if the two converge. I was wondering if it was possible to generate such a graph, with some data, and some statistical model. And indeed, it is rather simple, and it gives nice intuition about possible interpretations. Consider some (simple) classification problem. Here, we consider a logistic regression. We generate a sample of size , we fit our model, we compute the misclassification rate, then we generate another sample of size , we use our previous model to make some prediction, and we compute the misclassifiation rate. And we play with . The graph is not exactly the same as above, but it is probably due to the randomness of our samples. If we generate hundreds of samples, it should be just fine.